Is it just me or is it weird to offer specific zoo packages for proposals? I'm usually dubious about public proposals - and it's not entirely clear quite how public this is - because they put undue pressure on the proposee. I guess there's an element of that here with "How can you turn me down when I paid £135 for you to pet a tiger?" 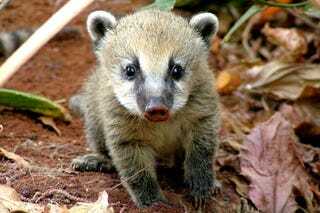 Above: A coati. Which I had never heard of. But mostly it just feels weird to pay specifically for a proposal package. I don't really have a position on this. I'm just surprised it's a thing. Is this a thing?